Siemens technology group is integration partner for the Volkswagen Industrial Cloud! This was announced by Volkswagen and Siemens today. Siemens will play a key role in ensuring that machinery and equipment of different manufacturers at the 122 Volkswagen plants are networked efficiently in the cloud. The resulting data transparency and analysis will lay the technological foundations for further productivity improvements at Volkswagen plants. In addition, Siemens and machinery and equipment suppliers will make applications and apps from the MindSphere Internet of Things system available in the Volkswagen Industrial Cloud. Volkswagen and Siemens intend to develop new functions and services for the Industrial Cloud together with machinery and equipment suppliers; these will then be available to all future partners. The development of the Volkswagen Industrial Cloud is gathering pace. 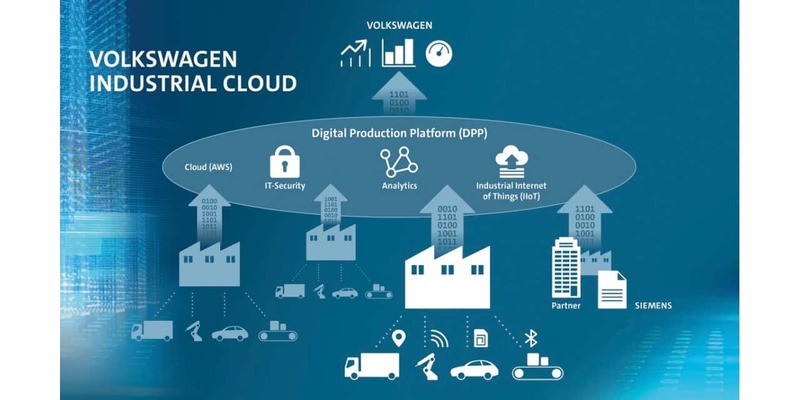 "We intend to make our Volkswagen Industrial Cloud a partner network with digital functions bringing benefits to all the participating companies. In Siemens, we have secured a strong partner with outstanding digitalization and industry expertise," says Oliver Blume, Chairman of the Executive Board of Porsche AG and Member of the Board of Management of Volkswagen Aktiengesellschaft responsible for 'Production'. "We are pleased to support Volkswagen in the development of its new Industrial Cloud with our open IoT platform MindSphere. For this purpose, we will network machinery, production systems and equipment more effectively using MindSphere and our automation platforms. This way, Volkswagen, suppliers and machinery producers will be able to leverage the potential of production data even more effectively. It will be possible to make production more efficient and flexible as well as further improving product quality," says Klaus Helmrich, Member of the Managing Board of Siemens AG. Siemens is contributing its comprehensive expertise in automation, the networking of machinery and plant and the world of industrial IoT to cooperation with Volkswagen. Apart from the applications and apps of the MindSphere platforms, this will also include industrial edge solutions. With this approach, production data will be processed directly by equipment and machinery or in the production process before they are transmitted to the Industrial Cloud. This will allow further optimization of complex production processes and also improve the data quality of the Volkswagen Industrial Cloud. For example, Siemens and MindSphere partners also offer applications for the predictive maintenance of machines with optimized maintenance cycles calculated in advance. Via the cloud, these can then be rolled out to all the Volkswagen plants. It will be possible to control Volkswagen's production environment and supply chain even more efficiently because the connected suppliers and machinery producers will also benefit from the knowledge gained from data analysis. With the Volkswagen Industrial Cloud, that is being developed jointly with Amazon Web Services (AWS), the Volkswagen Group is laying the foundation for the seamless digitalization of its production and logistics. In the long term, this will also include the integration of Volkswagen's global supply chain with more than 30,000 locations of over 1,500 suppliers and partner companies. In future, the Industrial Cloud will also be available as a platform for other partners.